Australia’s biggest Christmas festival – the Sydney Santa Spectacular – kicks off tomorrow at Rosehill Gardens Racecourse – offering up a North Pole selection of frosty festive fun for all agesfrom December 7-27. The three-week event will deliver the city’s coolest silly-season celebration – complete with one of Australia’s largest portable ice skating rinks, imported direct from Italy for a snowy sampling of European Winter in Sydney’s scorching summer heat. Also on offer will be Australia’s only double-decker carousel, unlimited rides, a snow toboggan slide, live stage entertainment, a glittering Santa’s Enchanted Forest with live snowfall, Christmas cookie-decorating workshops, reindeer ride-on training stables, interactive costume characters, fairy reading-times, live carolling, face-painting, special Santa meet-and-greets and more. Not just a winter wonderland for the little ones, the Sydney Santa Spectacular also offers up festive frivolity for adults and parents, with a Naughty Elves Wine and Cheese Bar providing the perfect pre-skate watering hole for some axels and bunny hops on the ice. And for the ultimate sugar rush – the event is home to Australia’s only fairy-floss encased soft serve ice cream – heaven sent direct from Mrs Claus’ North Pole kitchen. 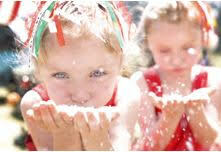 The gift of giving for children in need is also an integral part of the Sydney Santa Spectacular. The Festival begins its annual charity appeal on December 7 with a special VIP opening night for kids and families from Sydney’s Children’s Hospital. The event will be closed to the public on the night and children from the hospital will have free reign to experience all of the rides, activities and festive fun from the event with their loved ones. The launch event is expected to draw attendance from 3,000 people, including 1,000 kids and 2,000 family members from the hospital. The night is part of a broader charity appeal which encourages attendees throughout the 20-day festival to donate gifts under a towering 15-metre Christmas tree – one of the tallest giving trees in Australia. Over the past two years, the Sydney Santa Spectacular team has hand-delivered around 2,000 presents from the giving tree to Sydney Children’s Hospital, and event organisers are aiming for a record 5,000 gifts in 2017. “Being able to play Mr & Mrs Claus loading up the Team Santa van and delivering the gifts to the sick kids is the highlight of the event for our team and family,” said Sydney Santa Spectacular Co-founder/owner, Jade Evans. “A few years ago, our son was critically injured and spent months in hospital being cared for and rehabilitated, so it’s nice to now be able to give back and bring some joy to families that are going through difficult times. We know just how it feels and it’s the little things, especially at times like Christmas, that make all the difference,” she added.